Sign up for the Women’s Shelter of SLO County’s volunteer training program by Dec. 8 and play a critical role in ensuring that the shelter’s domestic violence services stay available at all hours. The Women’s Shelter Program provides comprehensive crisis intervention, emergency shelter, treatment, and education for residents of SLO County trying to escape the dangerous cycle of domestic violence. In 2014-2015, the program served 1,017 adults and children in the community, including providing peer counseling and crisis intervention for 638 people over the phone. 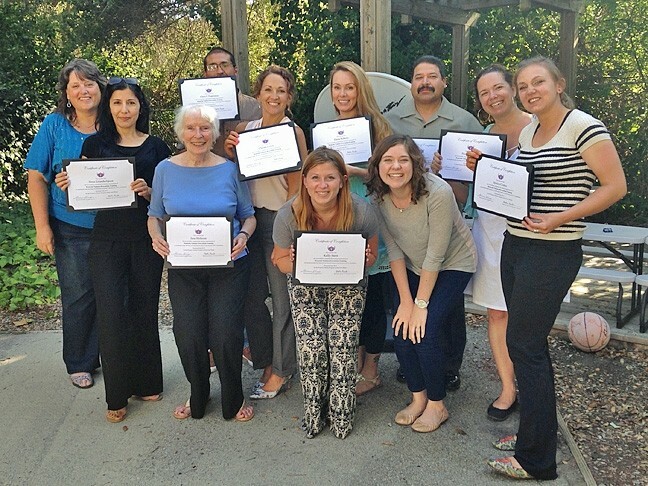 CERTIFIED COUNSELORS: Volunteers at the Women’s Shelter Program of SLO County pose for a photo with their domestic violence counselor certificates. The shelter is looking for volunteers to take part in an upcoming training program that starts on Dec. 9. Volunteers are critical to the 24/7 operation of the shelter. Christine Adams, a volunteer recruiter at the Women’s Shelter Program, told New Times that volunteers are indispensable assets to the program. Answering overnight and weekend phone calls—after hours when employees are off—is where volunteers really make their impact. Volunteer training has both a practical and educational focus. Trainees are instructed on the ways to provide real-time support for victims in addition to learning about the underlying dynamics of domestic violence and its impact on families. The training program begins on Dec. 8 and runs until Jan. 29, meeting on Tuesdays and Thursdays from 6 to 9 p.m. After completing the 40-hour training, participants become state-certified domestic violence crisis counselors. The certificate is valid anywhere in California and is a handy credential to have for a future career in social work. Volunteer shifts at the Women’s Shelter Program are typically from 5 p.m. to 8 a.m. on weekdays and 8:30 a.m. to 8:30 p.m. on weekends. Volunteers at the Women’s Shelter Program are usually a mix of folks, from young people looking for work experience, to retired people just wanting to help. But there is one common thread that tends connect them all. Interested in volunteering? Email Adams at cadams@wspslo.org or download an application at the Women’s Shelter Program’s website, womensshelterslo.org. Buy a bottle of “Water for Good” at Doc Burnstein’s Ice Cream, SLO Donut Company, or another local store and 56 cents goes to Lifewater International, a SLO-based organization that helps countries around the world with water needs. Water for Good is distributed by For Good Company, which sells high-quality products that also help raise money for charities. Intern Peter Johnson wrote this week’s Strokes. Contact him at pjohnson@newtimesslo.com.